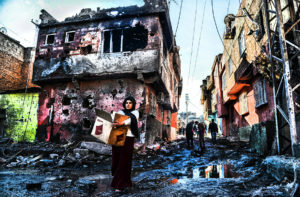 In the fall of 2015, Turkey declared war on its own citizens, bombing their homes, stationing snipers on rooftops, and destroying the ancient Kurdish district of Sur, a UNESCO historic site within the city of Diyarbakir. What was the Turkish government so afraid of? Based on news footage and live interviews, this is the untold story of how radical Kurds built a system they call “democratic autonomy” in Sur and other cities of northeast Turkey—a system based on pluralism, local control, and full citizenship for women. The Erdogan government found this level of democracy so threatening it responded by destroying the city, killing or jailing many of its activists, and dismantling the structures they had put in place for women’s liberation. The film will be followed by discussion with Ozlem Goner and Meredith Tax. Ozlem Goner is an Assistant Professor at the Department of Sociology and Anthropology at the College of Staten Island, CUNY. She earned degrees in Political Science and Sociology from Bogazici University, Turkey and her Ph.D. in Sociology from the University of Massachusetts-Amherst. Her work on memory and historicity; political economy and environment; and outsider identities has been published in academic journals and edited volumes. Her book entitled, Turkish National Identity and its Outsiders: Memories of State Violence in Dersim, was published by Routledge in 2017. Hicran Urun, born in Istanbul, is former editor of the pro-Kurdish newspapers Özgür Gündem and Özgürlükçü Demokrasi. She has been in detention since April, 2018 on charges “of being a member of a [terrorist] organization” for her work as a journalist. Zana Kibar is a PhD student at Mimar Sinan University in Istanbul, doing research on the destruction of cities and city cultures on the example of Cizre. He participated in projects “Forced Disappearances in Custody” by Truth, Justice and Memory Studies Association; “Forced Displacement” by Göç-Der Association; “Oral History” by Dut Ağacı Derneği; “Women’s Migration Stories” by Savaşın Tanıkları Anlatıyor [Witnesses of War] and others. He also worked as a correspondent and editor for Özgür Gündem. Cosponsored by Center for Place, Culture and Politics and the Emergency Committee for Rojava. This event is free and open to the public.